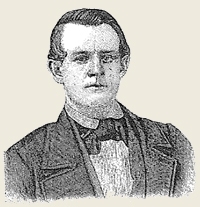 Ferguson was born in Ohio in 1832. When he was 18 he went to the California gold-fields, where he spent two years. He arrived in Sydney in July 1852 aboard the Don Juan from San Fransisco, then sailed on the Shusan to Melbourne. He spent time on the diggings at Ballarat, Ovens, Bendigo, Beechworth and McIvor. He was appointed to the VEE on a salary of £200 pa, as Foreman. Ferguson was discharged 18 September 1860 at Balranald and then allegedly challenged Burke to a duel. Burke wrote cheque #12 to Ferguson on 18 September 1860 for £16 13s 4d for one months pay. Ferguson sued the Exploration Committee for wrongful dismissal and was awarded £183 damages. He left Australia in 1883 and returned to the States. He died on 5 February 1925 in Chico, California. Issue 633, 15 February 1862, p. 7. The first mistake was "in starting an hour or so before dark, whereas the party by that time should have finished its day's journey and camped for the night." Nothing particular occurred in the journey through Victoria, "It was worthwhile, however, noticing that the leader nearly every night abandoned his party, and sought the shelter of the nearest public house or station." 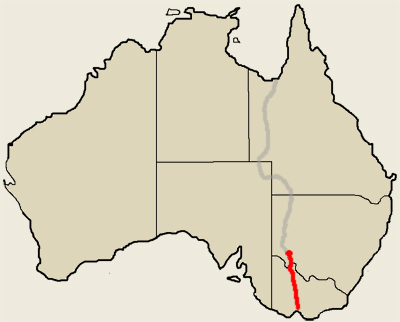 Across the Murray, at Balranald a quantity of streets was left behind, including the "only litter the party had for carrying the sick." The leader had by this time received a letter from the committee, instructing him to reduce his expenses and several of the men, amongst whom was Ferguson, the overseer, were attempted to he got rid of in the following manner:- They were ordered to remain behind with the stores left at Balranald, and to come on afterwards. Ferguson soon found out the contrivance, and there was a great storm between him and the leader in consequence. Challenges to fight were freely given by Ferguson, but not accepted. The disturbance ended by Ferguson and two others leaving the party. Ferguson, on his return to Melbourne, tried in vain to got a hearing from the committee, and went the length subsequently threatening it wills an action; but his Honor the Chief Justice of Victoria, in his capacity as a member of the committee assured his committeemen that Ferguson had not a Ieg to stand upon. There was no urgent reason, therefore, why he should be heard, and there was no great necessity for according him simple justice. Then follows a detail of alleged mishaps on the way to the Darling. The leader having engaged a couple of blacks to pilot him across the plains, it said that "he showed a want of confidence in himself." Camping places were not selected until after dark, waggon horses were exhausted from over work and want of water, rendering it necessary to send back the camels forty miles to bring four tons dead weight from the waggons. We think it necessary to refer particularly to such facts because the committee, having undoubtedly started the Expedition at the wrong season, the secretary, Dr Macadam, has endeavoured to prose to the commission that the Expedition started at the right season. He said, at the second sitting of the commission, that, "at the time Mr Burke left Melbourne it was considered he had ample time to reach the Darling, and cross over to Cooper's Creek at the most favourable part of the year." If the committee, or any other body, ever considered anything of the kind, it had no foundation whatever for arriving at such a conclusion, and it only thus makes known its lamentable ignorance of the climate of that portion of the continent." The point of the Darling on which the Expedition emerged from the scrub and plains, was opposite to Phelp's station. ''For a fortnight, during which the temporary depot remained six miles up the Darling from this station, the leader abandoned Isis party early every night, and sought the shelter of Mr Phelp's homestead." Here too stores and materials were left. "The horses went on almost without loads, and a heavier duty was now imposed upon the camels than they could endure. The second in command remonstrated, and he was instructed to throw nine camel loads, if he liked, into the river - and a quantity of goods was so disposed of." It was here that Bowman, who had been with Gregory, left the party, disgusted with the mode of proceeding, and not because, as asserted by Professor Neumayer, he was dissatisfied with the leader's proposed mode of payment. "We have nothing to do with the task of finding out who is responsible for this untruth. That belongs to others. W e fearlessly make such revelation's, because our investigations are, day by day, making known to us that the same duplicity has not only been practised by other interested parties, but real and important facts have apparently been purposely suppressed and concealed, in order to give a false color to everything connected with this extraordinary Expedition." What evidence our contemporary has to support all these charges against the leader, we know not; but we should think his statements ought to attract its notice of some of the members of the party. King can say whether they are exaggerated or not. The fact of Ferguson "freely challenging" the leader to fight, is not indicative of a spirit of subordination; and as to the present of brandy to Mr Phelp's overseer, mention as a fault by the "Yeoman," that was known long ago, and the explanation was that it was found necessary to remove temptation from the way of some of the men—perhaps of Ferguson himself. Monday, 6 October 1862, p. 5. Sir, there is a vacancy in the Victorian Exploring Expedition, which will be held open for you up to the time of its starting. If you think favourably of it, it will be necessary for you to come down at once, as it is intend to start in six weeks. (signed) John Macadam, Honorary Secretary, Exploration Committee. On the following day I received a letter from Mr Burke, in which he stated that he had been appointed leader of the expedition, and expressing his anxiety for me to join him; further saying that salary was a secondary consideration, and wishing me to proceed to Melbourne without delay. Upon the strength of this recommendation, I gave up my business at the Snowy River, and at one started from Melbourne. Upon arriving at Beechworth, two letters were handed to me, one from Mr Bookey, superintendent of police, and one from Mr Burke, the latter being merely a repetition I called upon Mr Bookey I called upon Mr Bookey, and he informed me that he had a private letter from Mr Burke, in which he was requested to find me out and send me to Town at once . When I reached Melbourne I met Mr Burke, when he informed me he thought he could secure the third officer's position, and two days afterwards he handed me my written appointment as a member of the exploration party, at a salary of £200 per annum. This sum I object or two, having always been receiving more than that amount. Mr Burke then assured me that, before we were two weeks out, my salary should be raised £3 10s for a week. Upon this I consented to go with the party. I stated to Mr Burke that, as it was probable the expedition would not start for five or six weeks, for I could be earning sufficient to keep me well, and that would be better for me than remaining in town doing nothing and incurring expenses. He said he required my services and assistance in getting things together, and that my salary shall commence from that date. But although I was constantly employed for five weeks before the starting of the expedition on its behalf, I never received one Shilling for expenses or wages. At last the time arrived for signing the agreements between Dr Wilkie, on behalf of the committee, and the members of the party. Then some difficulty arose as to the amount of my salary to be paid monthly to those on left behind. Sir William Stawell and Dr Eades thereupon made me certain promises, with which I was satisfied. These gentlemen probably could, if they chose, say how well those promises were kept. The expedition started, full of hope and fond expectations, I acting as foreman of the party. I may be excused for saying that my situation was no sinecure, taking into consideration that I had inexperienced men, unbroken horses, bad roads and heavy rain. I should be sorry to be thought egotistical through stating that Mr Burke and many times (not only to myself do to others) complimented me on the way things had been carried through; and I am a further state that he never found one word of fault with regard to my conduct. We continued in this manner between 304 100 miles, until we reached Balranald. Previous to starting from this place, Mr Burke called us all up, and said he had received instructions from a committee to leave some of the stores behind for a short time, and if he did so he should be compelled to leave some of the men. He then named Dr Becker, Messrs. Brahe, Langdon and the, McIllwaine and myself, telling us that we should await orders from the committee, and then come on and join him at the Darling. I asked to Mr Burke if we were to remain in charge of the stores, or was it that our services were not required further? If the latter were the case, it would be better for us to know at once. After some hesitation, he said, 'you are right. I have received instructions which I cannot depart from. You are to be discharged; but I assure you it is not my fault.' I had then to travel back again to Melbourne at a cost of something over £13. On arriving in Melbourne, I waited upon Dr Wilkie, and stated the facts of my case. He said he would lay them before the committee, and requested me to call in a week's time. I did so, when he said that Sir William Stawell, their legal advisor, was out of town, and that he preferred seeing that gentleman before giving me any definite answer. I called again in about 10 days, when I met with no direct reply to my application, but was asked to name some small sum, he, however, not promising that even if I did that, the committee would granted me anything. This not being satisfactory to me, I called upon Dr Eades. He told me that probably I had been badly used, but we were all asked to be so in this world; and he thought that it was as hard for the committee to have to rectify my wrongs as it was for me to put up with them. I have never one remedy, and that was to seek redress by law, the upshot of which was that I obtained, on the 27th of May last, a verdict for £183, 6s, 8d, with £6 for travelling expenses; but some point was still held in reserve, to be heard before four bench, when the case was decided in favour of the defendants, on the ground that Mr Burke had no power to discharge me. It was not proved that the committee had done so, and they denied ever authorising Mr Burke to do so; consequently, by this showing, I have never been discharged. Then, how about my salary? I think it will be considered by any one hard that I should have to suffer from the errors of either the committee or the employee to the extent of the whole of my demand, simply because the case is being bandied about from court to court, and postpone them postponed until my means are exhausted. For such a proceeding may be considered clever and cute by summer; others may be inclined to doubt its honesty. Trusting that your usual idea of Wright being Wright, will admit this to your columns. • The experiences of a forty-niner during thirty-four years' residence in California and Australia. (Also titled: Third of a century in the gold-fields). Charles D Ferguson; ed. Frederick T Wallace, Cleveland, Ohio: The Williams Publishing Co., 1888. • The experiences of a Forty-niner during a third of a century in the gold-fields. (Also titled: Third of a century in the gold fields). Charles D Ferguson, Chico, California: H. A. Carson, 1924. 154 p. : ill. 26 cm. • A third of a century in the gold fields: California gold-fields. Series: California centennial edition; 14. Charles D Ferguson; foreword by Joseph A Sullivan, Oakland, California: Biobooks, 1948.
xvii, 163 p. : ill. ; 24 cm. • Experiences of a forty-niner in Australia and New Zealand. (Also titled: Experiences of a forty-niner during thirty-four years' residence in California and Australia: Selections). Melbourne: Gaston Renard Publisher, 1979.
xxvi,180p. : ill. ; 22cm. ISBN 0959989943: Limited edition of 450 numbered copies. Reprint of chapters 16 to 27, and parts of chapters 28 and 31, from the author's Experiences of a Forty-niner during thirty years' residence in California and Australia, 1888 ed. Melbourne, Carlton Community History Group, 2010.